Your bones are savvy. They are light yet strong and they repair themselves when they break. What’s more – although you can’t tell – your bones continually renew themselves, replacing old bone for new. This isn’t unique. Other tissues and cells (most noticeably skin) replace themselves. But bones do it with adaptation, adjusting to meet the body’s mechanical and physiological needs. How does the skeleton achieve something so remarkable? New imaging technology is revealing a previously under-appreciated dimension of bones: the living cellular network built deep inside them. 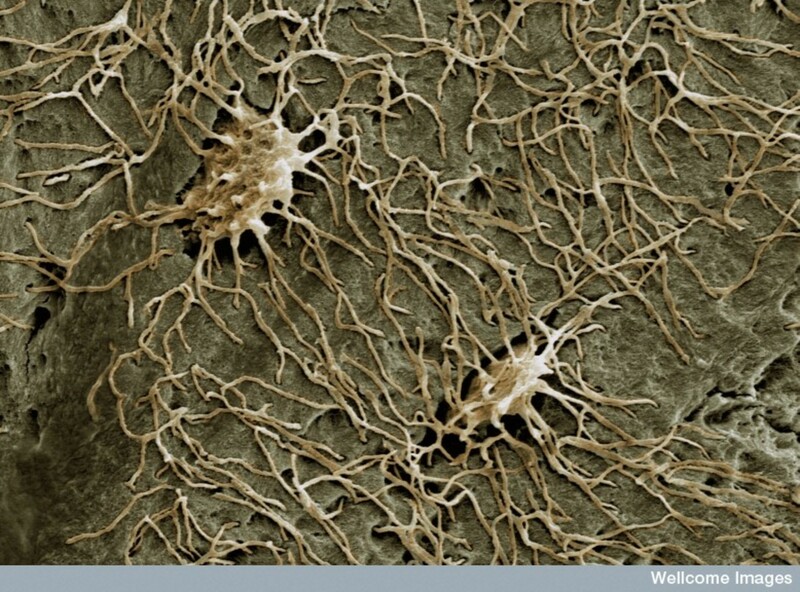 This living network is composed of the most abundant cell in bone: the amazing osteocyte. Osteocytes (literally “bone cells”) are buried alive in bone tissue whenever bone is formed. They develop long branch-like dendritic fingers that infiltrate the tissue and reach out to interconnect with one another. Living inside hard, rock-like bone, osteocytes have been difficult to study. They were considered inactive and uninteresting for a long time. They are now known to sense mechanical strains, orchestrate bone tissue renewal, and regulate calcium levels in the bloodstream. As more researchers investigate these cells and their network, the picture has become more elaborate. Osteocytes are clearly numerous and densely interconnected (see the image below), but putting an actual number on them had never been done. But it’s worth doing. Numbers in biology help us discover new insights, so much so that researchers have set up a database and handbook of many “bionumbers” across many species, collected from the scientific literature. For example, the number of synapses in the human neural cortex is estimated at 150 trillion. An MIT-led citizen science project involving 120,000 online gamers has already helped in understanding how the brain sees movement by mapping these connections through a project called EyeWire. But why should anyone care about the number of osteocytes? Because, as well as controlling bone strength and the release of vital minerals such as calcium and phosphate into the bloodstream, there is now evidence that these cells might influence how your immune system works, how fat you are, how your kidney works, and even male fertility. So, to get a sense of the size of the osteocyte network, we started to quantify it in the human skeleton. What we found exceeded even our expectations. It turns out that inside your skeleton lives a network that is almost as complex as the neural network of your brain. Taking recent imaging data (e.g. here and here), we calculated that the human skeleton contains about 42 billion osteocytes. That’s about six times the Earth’s population. In comparison, the human brain contains 86 billion neurons, packed in a volume (around 1.2 litres) comparable with that of the skeleton (which is about 1.75 litres). Although, of course, the skeleton is more spread out. When we added together the length of these little cell fingers, imagining them being placed end to end, we found that this network is about 175,000 kilometres long. That’s more than four times the Earth’s circumference, and almost identical to the total length of axons in the brain: 180,000 km. We based many estimates on simple algebraic manipulations of previously published data. But one essential piece of information could not be estimated easily: the number of connections osteocytes make with their neighbours. A brain without connections can do nothing, so estimating connections in the osteocyte network is important. Unfortunately, connections between osteocytes are hard to see directly. What is seen instead are the little tunnels through the bone that osteocytes and their fingers live in. So to measure this proxy tunnel network and the cell network within, we resorted to a mathematical model of dendritic finger branching. Feeding this model with data on the proxy network, we calculated that 23 trillion connections exist in the osteocyte network of the human body. So, by these measures, your skeleton is a lot like your brain, with a similar number of cells interconnected in a similar sized space. But why do our skeletons need such a complex network? We don’t know exactly, but we do know that these cells exchange information, just like neurons do. The tunnels that osteocytes occupy can still be seen in old bones, including dinosaur fossils. We can use this information to understand how bones have evolved to become the self-detecting and self-regulating biomaterial we own; that’s something that can’t be done with brain fossils. Osteocytes communicate with each other about where the skeleton is weak and needs to be strengthened, or where there is damage that needs to be fixed. These messages are transmitted to cells on the bone surface that are able to remove damaged bone (osteoclasts) and form new bone (osteoblasts). We know very little about how these cells communicate. But if we did, we could find better treatments for skeletal disorders like osteoporosis or osteogenesis imperfecta, and find ways to get football players back on the field more quickly (and more safely!) after a fracture. In the meantime, the next time you stand up, walk around or do weights, think about how the network of osteocytes in your bones is responding to the stresses and strains you are putting it through. And thank your osteocytes for keeping your skeleton strong (and smart) enough to support you.